Organic. Fair Trade. Handmade Blends. ✓ Supportive Community, Lots of Perks! "I've never been as delighted with a 'surprise me' subscription - every tea is exceptional and wonderful and I've never gotten a single one that I consider 'throw away' as always happened with other subscriptions." Join today and get a 20% coupon + free shipping for our online store of teas/accessories. "I just wanted to take a minute to tell you that even though I've only gotten my second tea today, it meant so much to me. Not only is the tea outstandingly delicious, it's just so much fun when I go to the mailbox. 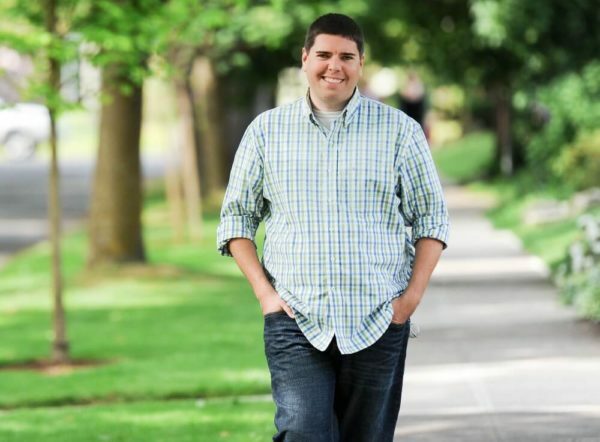 It's one of the nicest things that I think I've ever had - I look forward to each month." We’re committed to providing you only the best. Our artisan, handcrafted blends are free from hidden sugars, sulfites, GMO’s and artificial anything (we are also vegan, dairy free, and gluten free). While each month's blend is a surprise, some of our recent blends have included Mint with a Hint of Coconut, Pears and Cinnamon, Chestnut Chai, and Raspberry Earl Grey. We'd tell you the next one but... it's a surprise! I’m Andy Hayes, founder of Plum Deluxe and chief tea maker. Please allow me to walk you through the process I use to create the unique tea blends you’ll discover being a member of the Plum Deluxe organic tea of the month club. While you may be envisioning lab coats and a giant factory with stacks of ingredients and curious equipment, the Plum Deluxe studio in Portland, Oregon is decidedly more low-key. Using ingredients from around the world, our flavors are often informed by our love for the Pacific Northwest. Examples of this can be seen in our limited-edition Portland Rose City Chai and the best-selling Oregon Breakfast Black Tea. Next I steep, sip, review, adjust, repeat. Teas that pass muster often go out to a small group of “tea testers” for further evaluation. Only the best teas are hand-blended in larger batches for our monthly tea subscription box members. We are a small, specialized, family owned-and-operated business. You have my promise that everything we make is blended with love, positive intentions, and so much gratitude for you, our Plum Deluxe customer. Do I need to pay customs fees or taxes (VAT)? Currently there is no VAT on tea in Australia due to it being a foodstuff/grocery item. The typical tea club shipment size is below customs and duty threshold. However, customers are responsible for any customs fees, duties, or taxes required upon delivery. What’s inside each monthly shipment? 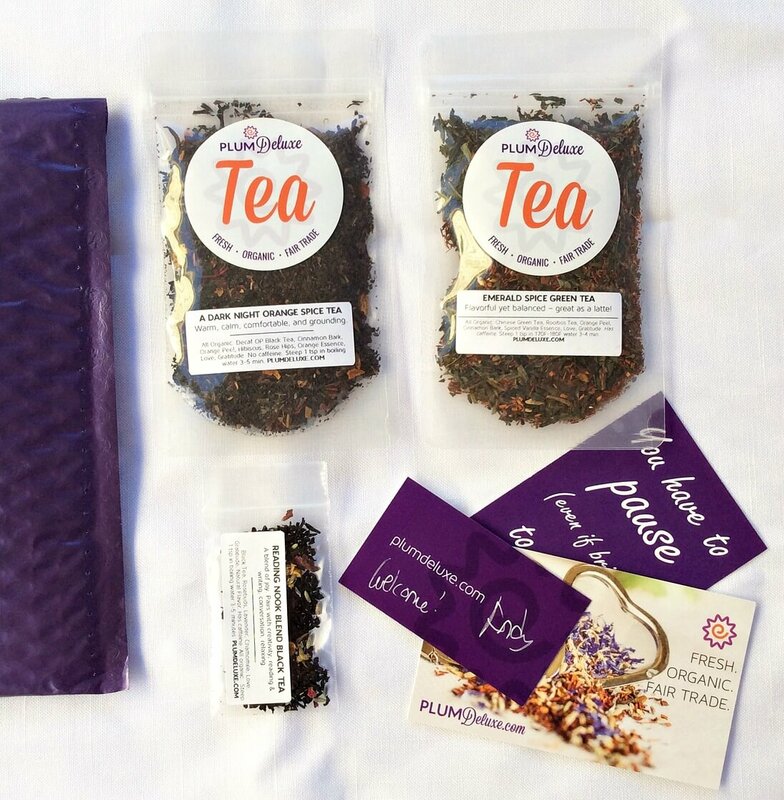 Depending on your plan, each organic tea of the month club shipment contains approximately 1-2 oz of tea as well as sprinkles of gratitude and affection for being a Plum Deluxe customer. We also include our “surprise scoop” of another sample tea, as well as gifts and surprises. Links to access online information on brewing instructions and recommended uses for the tea and recipes are also provided. Wait, really? Shipping is free? Shipping as little or as much tea as you want is included in your monthly subscription fee, yes. So great, eh? As an international subscriber, your extra goodies will be included in your next monthly shipment. I’m totally new to tea but curious about the creative aspects of your blends. Is this for me? Yes, we’d love to introduce you to the world of high quality, loose leaf tea. Our tea community is friendly and inviting, and we aim to answer all questions posted in the private Facebook group promptly. Consider our tea experience a big hug welcoming you into tea enjoyment. Why do I have to signup for 3 months of tea? Can I order a sample or just a small one-off order of tea? In order to keep our monthly subscription price low, our memberships are quarterly. As an international subscriber, shipping times are longer so this also helps avoid you getting charged for your second month before receiving your first month, which would be really annoying, right? Quarterly dues also help minimize currency rate fluctuations. If you happen to find your home currency favorable to USD and want to pay for additional months on your subscription, we're always happy to do that! You just have to email us and ask (if you aren't already a member, please signup first). If you just want to try our teas first, head on over to our online tea shop and pick out something. Treat yourself! We take our tea ingredients seriously. Unlike most companies, we source all of our individual ingredients and then put together the recipes and blends all in house. This ensures the highest quality and the most creative, flavorful combinations. Almost all of the ingredients purchased for our teas are backed by USDA-compliant organic certifications. In cases where we work with a non-certified vendor, we are purchasing ingredients that are carefully wildcrafted, ingredients that are from a region of the world that does not have an organic certification program (such as parts of Japan or Taiwan), or from small family farms that cannot yet afford their certification or have not yet completed their certification. In all cases, we very carefully vet our products to ensure their are full of flavor, without any unwanted chemicals, artificial flavors, or genetically modified organisms. Thank you for trusting us to find the freshest, most delicious ingredients that are grown on sustainable, fair trade farms by companies we know, like, and trust. Are most of your teas caffeinated or caffeine-free? The bulk of our featured club teas have caffeine, but sometimes we send all subscribers an herbal tea. We are one of the few companies to offer a caffeine-free / herbal tea subscription – you can choose no caffeine on the $10/month plan. And if later on in the year, you change your mind and want to change your plan, no problem. You can always email us if you have specific preferences – we always try to accommodate. I have an allergy to a particular herb – can I get it excluded from my shipment? Yes, once you have subscribed please email us and let us know more about your allergy – we can mark it down on your profile so you can enjoy your tea subscription without health threats. However, we use a single processing facility for all teas so we cannot guarantee prevention of cross-contamination; if your allergy is severe or life-threatening, please check in with us before you purchase. If we offer you an alternative tea to avoid an allergy, it will be from our signature selections, which in time could mean you receive a duplicate tea. Plum Deluxe teas are hand-blended in a single facility that also processes tree nuts. Can I set tea club taste/flavor preferences? Beyond your initial caffeine preferences, as mentioned above please let us know if you have specific allergies or ingredient concerns so we can note them in your profile. We do not need to know about gluten, vegan, or dairy intolerances – these will never be included in the club. However we do not currently allow subscribers to set detailed flavor profiles. 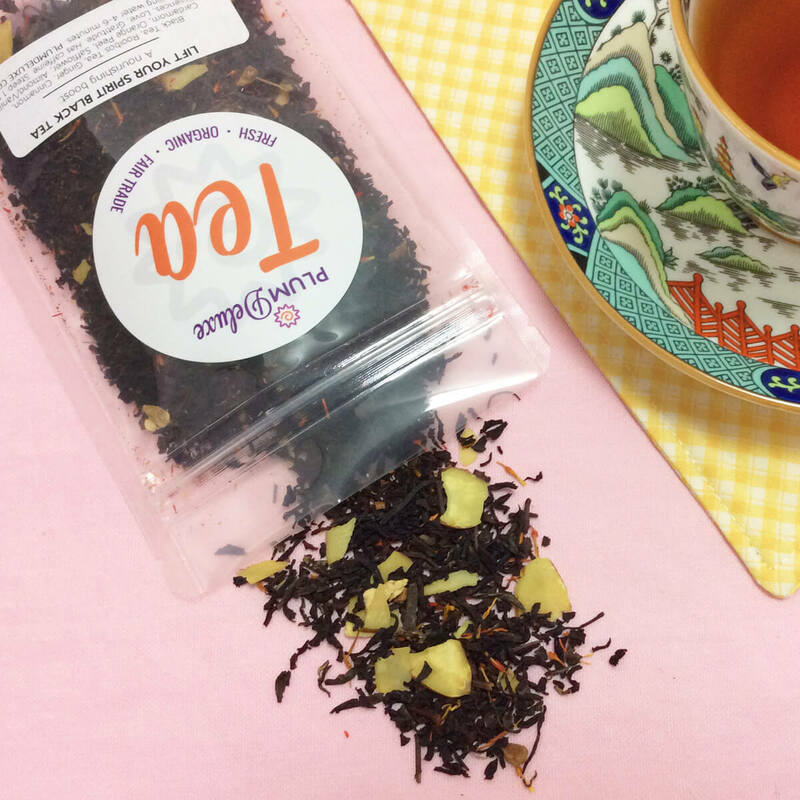 Part of the magic and adventure of the Plum Deluxe tea subscription is trying new flavors, and we many of our subscribers are new to loose leaf tea. We have found that people limit themselves unfairly when given the opportunity to set flavor preferences – many of us had poor quality ‘supermarket’ teas in our early tea experiences, which spoiled our taste buds into not liking certain flavors. We get emails every day from club members who are grateful we exposed them to a new experience to many flavors they thought they didn’t like, everything from earl grey or coconut. That said, if you know there is a particular item you just cannot tolerate, please let us know and we can update your profile accordingly. Will I get shipped duplicate teas? 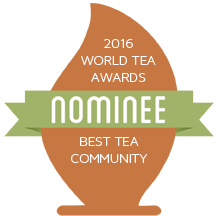 If you have an allergy or other tea preference in your profile, it is possible to get a duplicate tea throughout the year. We try to keep this to a minimum, although some customers have a specific tea on profile with us that they prefer, so be sure to be in touch with us so we can make sure you have the best tea experience. When will I get my teas? How are the teas shipped? We know that feeling of rushing out in your robe each morning to meet the mail delivery, waiting on pins and needles anxiously for your delicious teas to arrive. We currently ship via USPS First Class Mail that interfaces with the Australia Post. Teas are usually mailed by the 8th of each month and arrive 2-3 weeks later - unfortunately international shipping comes with a good amount of variability, but we will be sending you a tracking link that works door-to-door. Do all of your teas have plums in them? None of our teas (at the moment) have plums in them. Plum Deluxe is our name, and the “plum” refers to the old English definition of plum as something that is lucky and unexpected. In more traditional tea cultures, anything that was plum related was said to be sacred and auspiciously special. How do I get more of a tea blend that I really loved? Yes, our tea is pretty awesome, thank you. Most of our teas are limited-edition, as we hand-blend each batch and at times use ingredients we can’t get larger quantities of. We offer subscribers the opportunity to purchase additional tea depending on interest from the community and availability of ingredients – check the private member’s website for blends available. On occasions, a limited-edition blend “graduates” to become one of our regularly-available signature blends, which we usually announce with trumpets, fanfare, and of course a big tea party. And don’t forget, in and on the private member’s website, you can rate and review each blend. We use your feedback to determine future blends. Recurring subscriptions are billed in regular 3 month increments from your initial purchase date. Nobody likes money surprises – unless they’re a winning lottery ticket. If you ever have questions about your renewal, please just email us. Are your loose leaf teas good on ice? Wheter you just like iced tea for the hot summer months, or if you drink iced tea year-round, our teas work just fine on ice. Of course, in the summer we take extra care in making the best iced loose leaf blends, but we have many iced tea lovers keeping their cool in our community. Can you give some examples of previous blends? Each blend is tailored based on community feedback of previous blends, as well as to suit the season (heartier teas or teas paired for heavy foods in winter, lighter teas/iced-friendly teas in summer). Some examples of popular blends we’ve had recently: spicy lemon chai, raspberry earl grey black, pomegranate jasmine white, vanilla spice green, orange mint honeybush… Don’t forget that we have a caffeine-free option if you need it. Do you do custom tea blends for parties, weddings, events, restaurants, hotels, etc.? Yes, we’d love to – custom blends are our specialty and often the life of the party. Depending on your needs, we can also arrange for private label or custom packaging. Consulting fees & minimum order amounts apply for custom blends – learn more here. Plum Deluxe teas are blended by hand and we only make enough of each batch to fulfill current demand, which is why we work on pre-order basis. Due to the exacting and very personal nature of our specialty blends, we cannot offer refunds or exchanges on the tea that we sell nor can we offer refunds on organic tea of the month club subscription payments. If you find that you get a monthly tea box shipment that isn’t well, your cup of tea, we ask that you pass it along to a friend who will enjoy it. Then share your feedback with us so we can continue to improve our product. It’s easy to cancel your recurring plan – the link is right here!